Skip the store-bought granola and whip some up at home using ingredients already in your pantry! 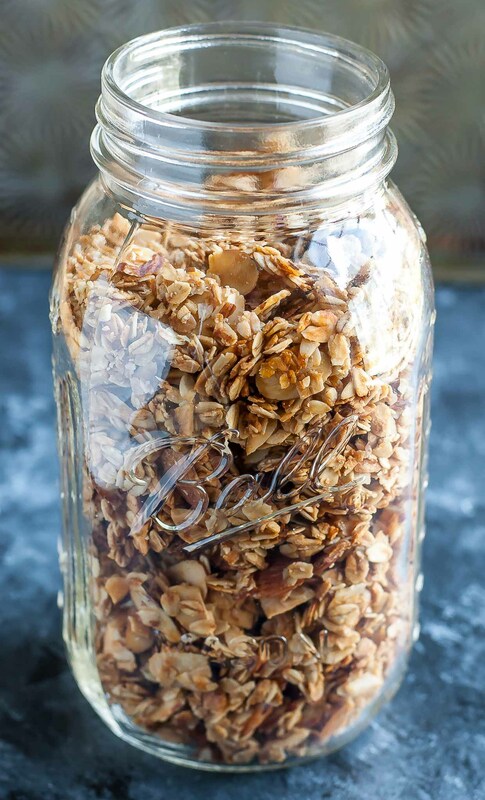 This healthy homemade granola recipe is quick to prep, super easy, and sweetened naturally! True life, I’m a speed reader. The skill was taught to me during an SAT prep course back in High School as a means to help us rock the upcoming exam. I don’t remember my exact score (I tend to block out traumatic life events) but I will never forget the sheer agony of the exam. The test came and went, the twitching subsided, and the skill that was speed reading stayed with me forever. Or should I say haunted me forever? I have a voracious appetite for books as it is and it’s not lost on me that my mom deemed it my most expensive hobby. I could rarely walk away from a book once it’s binding had been cracked and, as a result, she had to buy me series of books in their entirety, for fear that I would finish one and promptly decide to take my crayons to the walls or something equally as destructive if left alone. Come on!! It was one time! I read ALL THE BOOKS. And when that wasn’t enough, I re-read them. My bibliophile ways have slowed a bit since having the chickpea and I long to tear through books like I used to. Even with my penchant for speed reading, starting a book before bed is a guaranteed all-nighter for me. I tend to slow my reading as a book starts to pick up steam and reveal all it’s delicious plot twists and OMG IS THE SUN SERIOUSLY OUT WHAT ON EARTH TIME IS IT!? So I try to limit myself to the occasional all-nighter while the majority of my reading revolves around Dr. Seuss tongue-twisters and entirely too many Sandra Boynton books of which I’ve committed to memory and recite slam poetry style when I’m bored. Then there’s Paul who will read kiddie books William Shatner style and leave me writhing on the floor in giggles. My literary dynamic has changed quite a bit but books are still very much a joyous part of my life. Hi I’m Jenn and I like to ramble! Shall we make some granola today? This granola is the most basic of bases, perfect for all your favorite mix-ins. I’m really feeling the simplicity vibes lately. No fuss, no muss, no mile-long grocery list of ingredients. Just good simple granola with a kiss of natural sweetness. 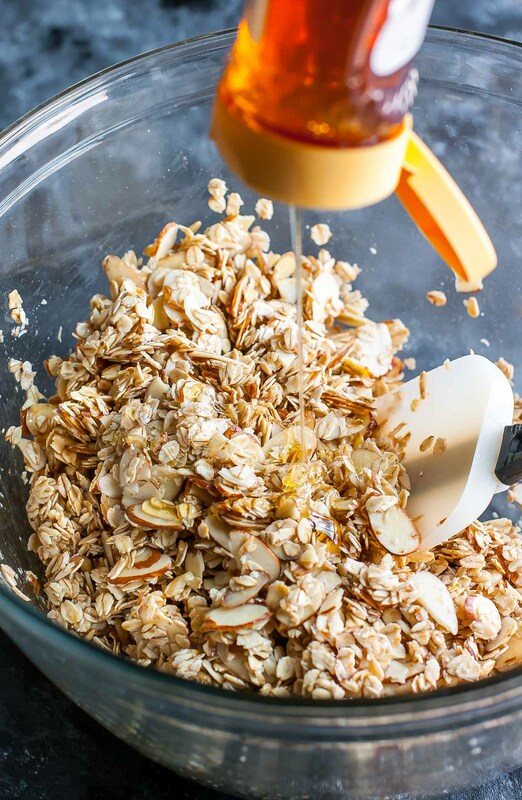 Whip up this tasty granola in advance for all your snacking/toppings needs! It can be stored in an airtight container for 2 weeks, making it a perfect prep-ahead snack. Naturally sweet and gluten-free to boot, this classic granola is sure to be your new breakfast staple! Pre-heat oven to 300 degrees F and move the center rack up a level so it's on the second level/rack from the top. In a large bowl, whisk together maple syrup, coconut oil, vanilla, honey and salt. Add your oats and sliced almonds and fold the mixture together. 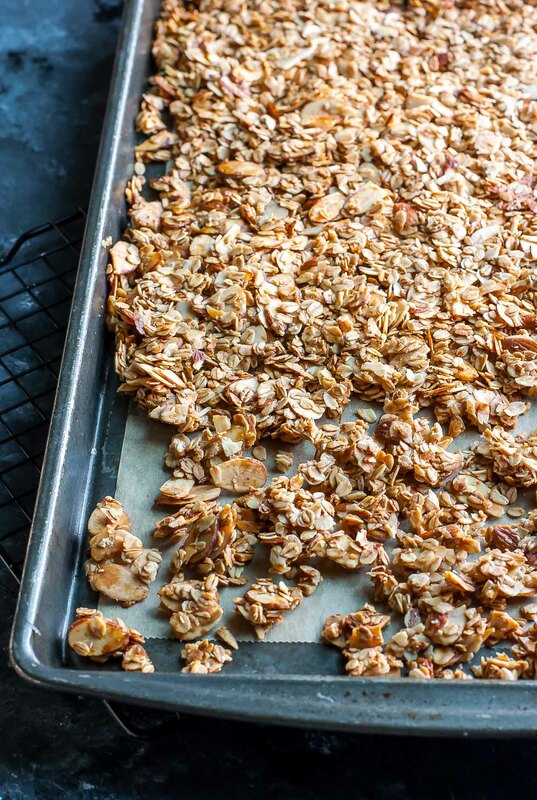 Use a silicone spatula to help pour the granola onto your parchment-paper lined baking pan. If you want large chunks of granola (the best!) flatten the mixture into an even layer with your spatula, adding pressure so the granola is nice and compact. Bake for 20 minutes, rotate the pan (180 degrees) for even toasting, then bake for an additional 10-15 minutes or until golden and crispy. I like mine a little more on the golden/crunchy side- YUM! Ovens vary from home to home so just keep an eye on it and yank once it's your degree of golden perfection! NOTE: I don't stir at the halfway mark so I can break it to chunky clusters when it cools - love it like this! For this recipe I used an 11x17 rimmed baking pan/sheet and spread the granola over 2/3 of the pan. If using a 13x18 baking sheet, spread granola mixture so it covers only half the pan, then flatten with a spatula. 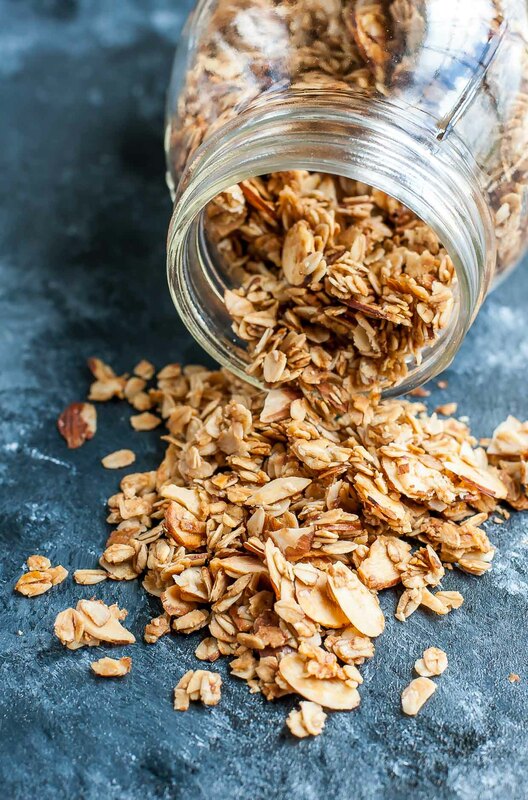 Granola isn't the quickest recipe due to it's 35-40 minute bake time BUT it's super easy to toss together and very hands off for the most part, making it seem a lot quicker by default. I almost always make mine in advance for the week, feel free to follow suit! 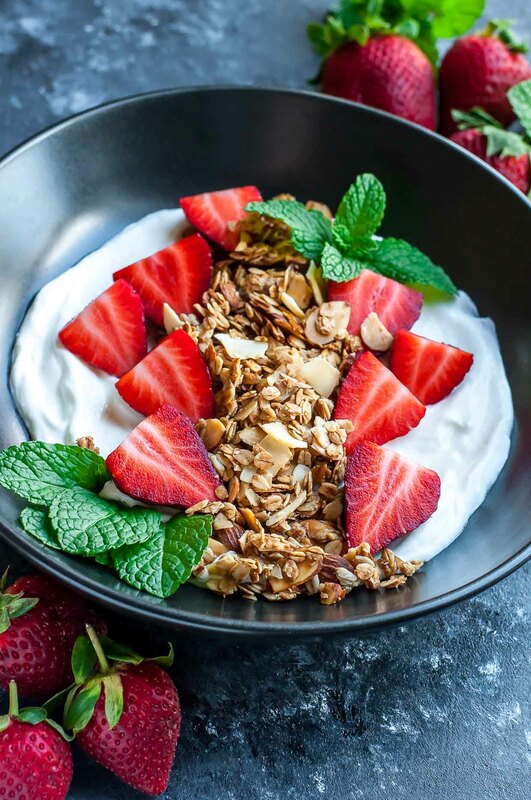 Once you have a big, golden, delicious batch of granola made you can keep it in an airtight container in your pantry for 2 weeks, making these delicious breakfast bowls SUPER speedy and utterly easy to make! For a burst of tropical goodness and some heart-healthy fiber add some flaked or shredded coconut to the mix after baking. To ensure this granola is gloriously gluten-free, simply check the label on your oats to ensure they're GF certified. 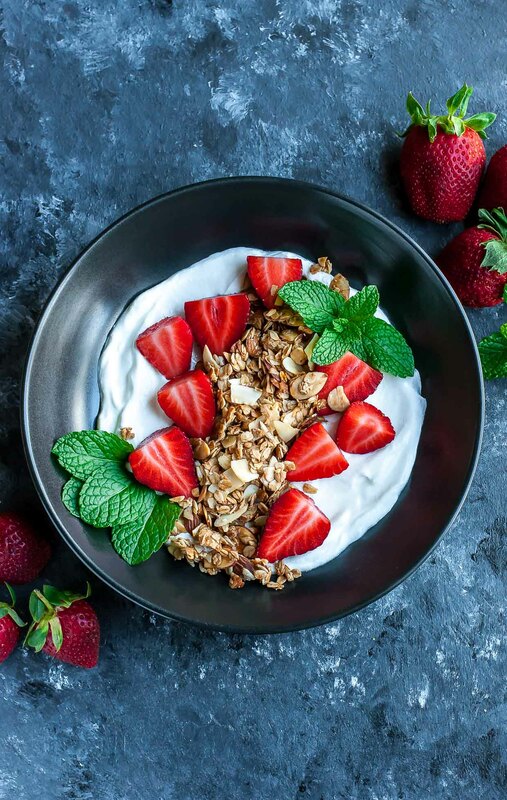 Top a jumbo scoop or two of your favorite Greek yogurt with fresh strawberries and top with as much granola as your heart desires! 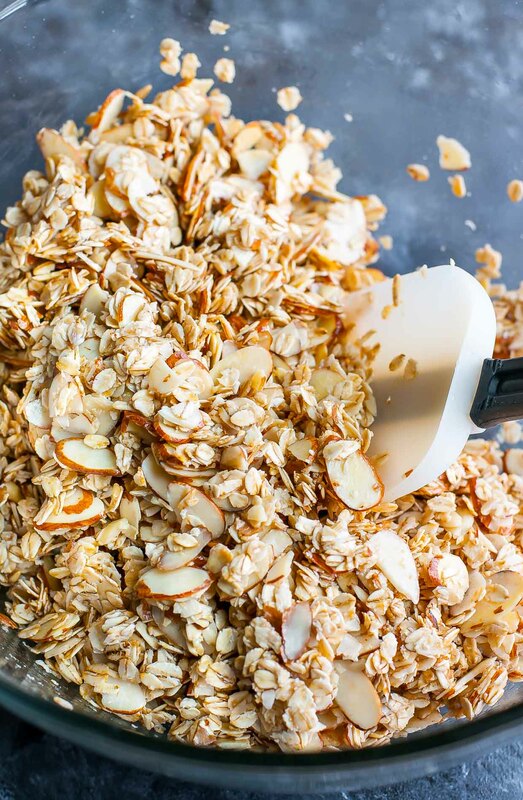 In addition to this healthy homemade granola recipe, here are some of our favorites! A++ This granola is excellent, not too sweet, just right! I added a tsp of both chia seeds and cinnamon. Used half pecans/half almonds. Added the coconut at the half way point of baking. Excellent. Thank you so much for a wonderful recipe. Wonderful granola recipe! Whole family loves it!! Had this at my daughter’s home and my husband LOVED it! I just made some and it is soooo easy and delicious! Thanks for a recipe that makes our good yogurt even BETTER! Fox in socks leaves my tongue in Knox (er…knots). Sandra Boyton and I could be besties now. Last you’ve inspired me to make some granola. It’s Brenner far tooooo long. Yeah girl! Get your granola on! I just made this tonight, added a half cup of flaked coconut after it cooled down and it was delicious. I will definitely be making this granola again ? Yummy!!! Loved this with Greek yogurt or alone! Easy snack!! LOVE this recipe! Thank you so much for sharing! Just curious if the coconut oil measurement is before it’s melted or after. Thanks! Thank you Christine – so glad you’re loving it! I measure it before melting but here in FL mine is never very rock solid – it’s always kind of in this in between state of melted and solid, lol! This granola is so easy to make, and so delicious! It’s perfect on top of my plain yogurt in the morning. I love that you can simply adjust the maple syrup if you need to reduce sugar content. Hey Barb! Love the addition of sunflower and pumpkin seeds – so yummy! 🙂 If you divide the base recipe into 8 servings there are approx. 261 calories per serving or less if you stretch it to 10 or more portions. Do you have nutritional information, i.e. sugar and carb totals for 1/2 cup serving. My husband needs both to be pretty low because he mixes it with honey bunches of oats too. Thank you. Do you happen to have the calories for this recipe? I love a cinnamon/almond taste! Have you ever tried adding cinnamon to it? You know what, I bet this granola would be AMAZING with a kiss of cinnamon Donna! Let me know if you try it — I think I’ll try it with cinnamon too! I am going to make a batch at 300 degrees (my oven runs hot too), but I was wondering what is a serving size? 1/4 cup? 1/2 cup? Thanks for any info you can give! I made this and baked for 40 min exactly at 300 degrees and it came out incredibly burnt — inedible! Same here. Not burnt exactly but quite dark. Hey Haley! I’m so sorry to hear that! Lucy hasn’t answered so can I pick your brain? I’ve made this recipe several times and it always works so I’m trying to troubleshoot. I have a batch in the oven right now and another ready to go behind it to test just in case so I can evaluate them both. Did you make any changes or swaps when you made the recipe? Any different ingredients or maybe a change in bake temp (350 vs 300) or skip rotating the granola? I’d love to know, thank you! This looks great! Do you have a recommendation for how much coconut I should add? I love it! 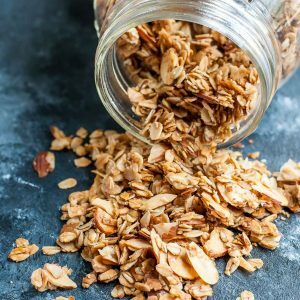 The first time I made granola, I was so surprised at how simple it was – why oh why is store bought granola so expensive when the main ingredient is oats? I never buy granola now, and love experimenting with different add-ins. This looks like a great recipe! I love granola and will have to try this. Thanks! Thanks Kim! Hope you adore it!